We eat a lot of yogurt in our house. A. Lot. I find these yogurt cups useful and just can’t throw them away. 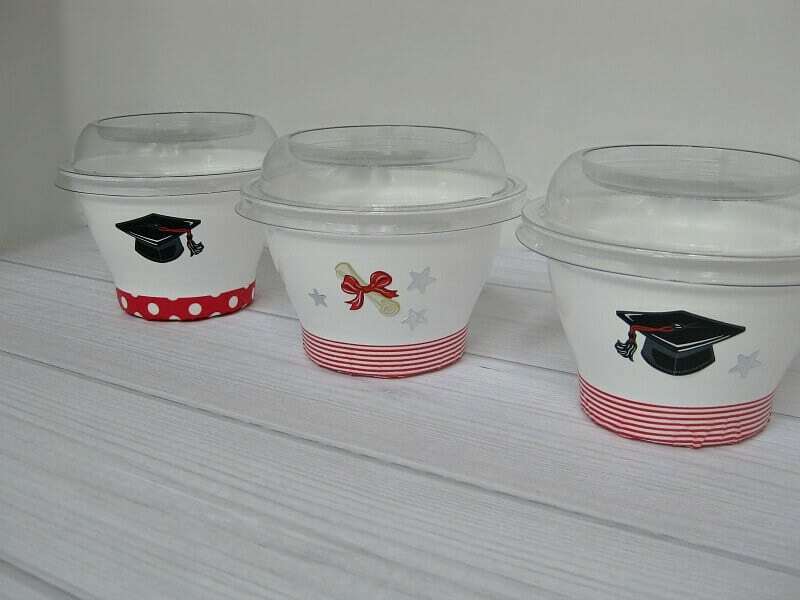 Last year just before my oldest daughter’s graduation party, I realized that I had about 50 of these yogurt cups sitting in my cupboard. 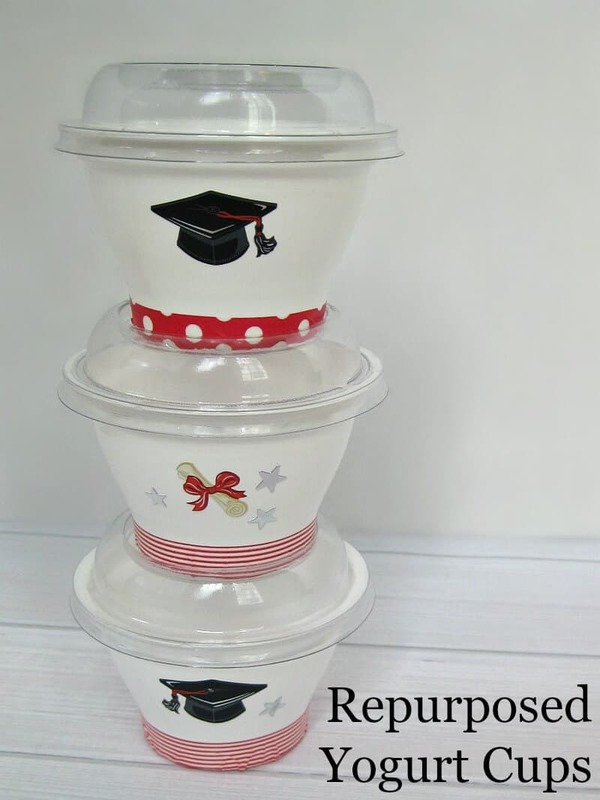 I knew that they’d be perfect for holding salsa at the graduation party so I decided it was time to decorate these repurposed yogurt cups for the party. I simply wash these yogurt cups each time we finish one and store them in a cupboard until I have a new idea for them. I’ve made St. Patrick’s Day treat cups, Mardi Gras treat cups and Advent Calendar treats using these yogurt cups. My crafting buddy, J., came over one day and we decorated the yogurt cups with graduation themed stickers and washi tape. The hardest part of the project was wrapping the washi tape around the curved surface of the yogurt cup , which wasn’t that difficult. It was an easy project that you could have your kiddos help you with. 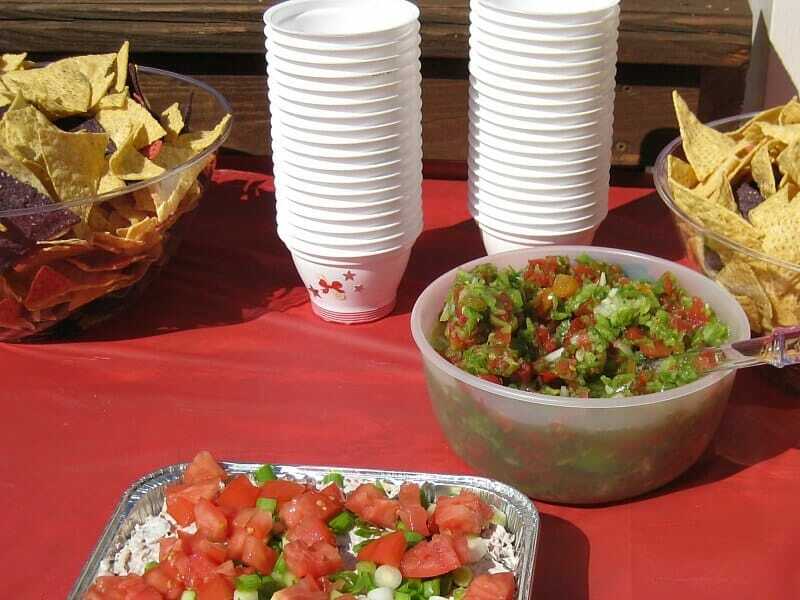 We put the cups on the snack table near the salsa so that the guests could have their own individual bowl of salsa and not have the salsa dripping all over their plate of food. 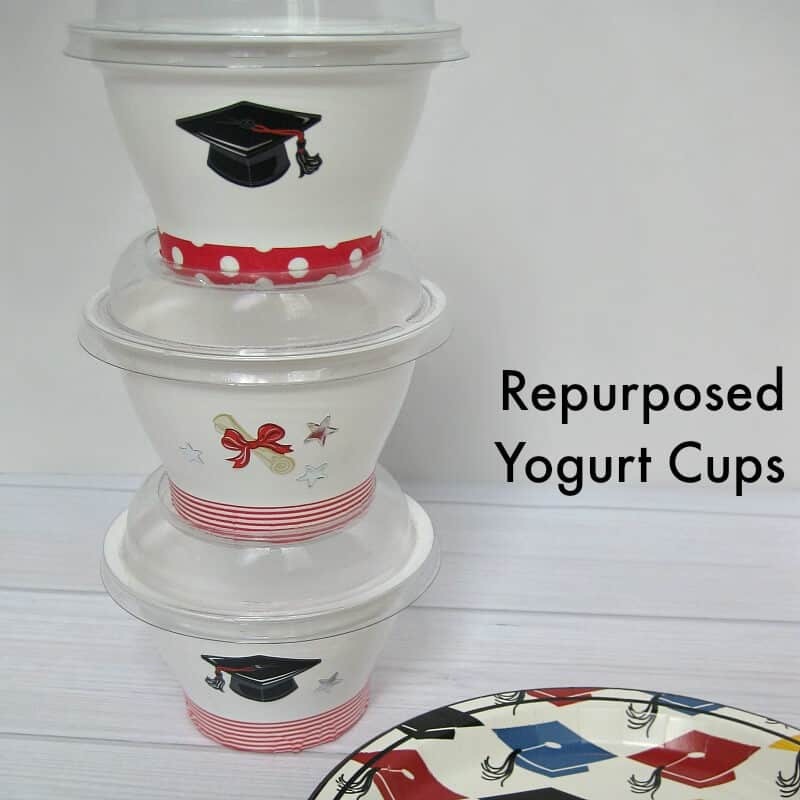 Do you have a party coming up that you could use repurposed yogurt cups as individual dip bowls? I am going to start saving all of our yogurt cups! It’s probably too late for me to have enough for a graduation party, but I can probably be ready by our 4th of July party. Love this idea! This is a really great idea! I would have never thought about doing this, but now that I have seen how cute they came out, I can think of so many ways to use them. Thanks, Cynthia. I love these little yogurt cups. I haven’t seen yogurt cups like that around here. I wish they did. They are so cute all dressed up for graduation. Thanks, Darlene. 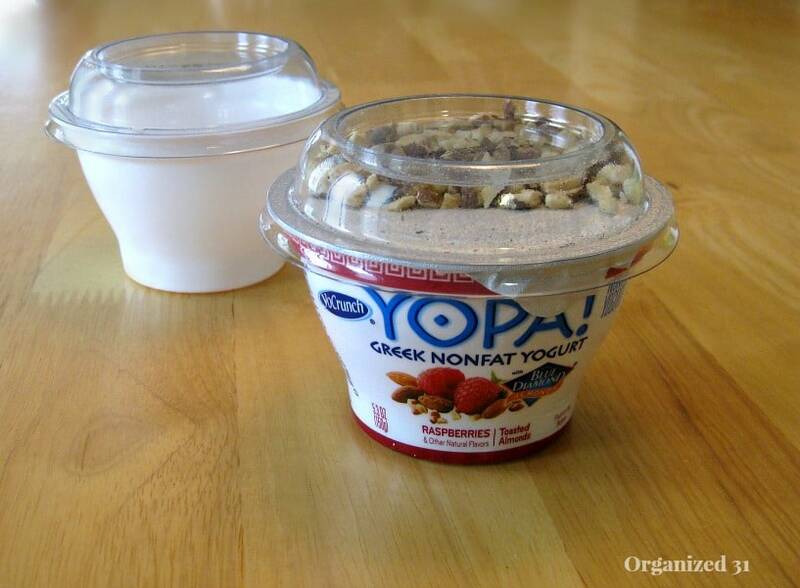 I love these little yogurt cups and repurposing them. What a great frugal tip! I love that something that is normally thrown in the trash can be upcycled. Great job! I loved the idea so much. Unfortunately we have the yogurt cups with non reusable lids. I wish they have so I can save them. Thanks, Heather. I just hate to throw things away that can be recycled into something useful.